Throughout the course of an average summer, I field a lot of questions about Musky fishing. Some come from customers, others from web site visitors and the rest from folks I meet along the fishing trail. Most of the time we talk about where they’re bitin’, what they’re bitin’ on and so on. Now if I lived in Wisconsin or maybe up on Lake of the Woods, a lot of these conversations would translate into Musky fishing trips, but not here in Minnesota. Lots of times the chat about Muskies is just that, passing conversation. I don’t know why exactly, but here in Minnesota there are still a lot of folks who are curious about Muskies and Musky fishing, but manage to avoid actually trying it. Somehow they’ve been convinced that there’s a lot more to it than there really is. Granted, there are a few basic tricks to learn and you do need to buy at least a few pieces of special gear to get started. But if you want to, you can unlock the mystery and become a better Musky angler a lot faster than you think. So for the curious but uninitiated, lets have a quick peak at what it really takes to get started. First off, let me say that the big trick (if there is one) is to spend some time on “good Musky Water”. You’ll learn more and develop confidence a lot faster if you spend your time fishing lakes with good populations of fish. Avoid the old trap of heading out to every lake that is rumored to have a couple of big ones, you can do better than that. Thanks in large part to the efforts of Musky devotees and organizations like Muskies, Inc. with cooperation from the DNR, there are more Muskies to catch today than ever before. Take advantage of the wealth of information that these folks have put together and in short order you’ll have a good list of quality lakes to get started on. I’m trying to keep this simple and take it step by step, so I’m breaking this down into sections but even before you buy your first plug or plan your first trip, you can make one decision on your own. That is to decide which you like better? Trolling or casting? Not only for Muskies but in general. Most folks have fishing preferences sort of “built in”. You see, one key factor in being a successful Musky fisherman is to like what you’re doing enough to stick with it through the low action times. In other words, you’ll stay more interested if you start with a style that you already know you enjoy. Your battle is half won already if you just stay on the water long enough to catch your first fish. So, if you really love to troll but don’t care for casting (or vice versa), go with a system (style) that most closely matches the way you fish for other species. The two approaches have their differences and might require different rods, baits and location. So avoid starting down a path that’s going to make the journey more difficult by trying to learn both approaches at the same time. For part one, I could have chosen either basic trolling or basic casting presentations. It’s a tough choice because each has its own merits and each is productive in its own way. So in the interest of being objective and scientific, I flipped a coin and casting won. My first bit of advice here is to choose three or four of the simplest presentations and stick with these “no-brainer” presentations at least during your first several trips. No matter how tempting it is to branch out too early, doing so will only complicate your experience by mixing too many variables. Believe me, you will have plenty of time to fill up your new Musky Tackle Box, but for now, you’ll want to spend the lions share of your time learning about Muskies, where they live, what they eat and so on. You can’t do that when you’re bent over the tackle box changing baits all day long! Casting for Muskies is an approach best suited for fishing shallow water cover. 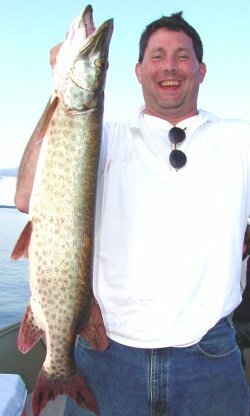 In fact, you can even find good areas to catch Muskies from shore. Water depths of 20 feet or less and structure like weed beds, rock piles, shoreline drop off areas and weed choked bays. You’ll need one versatile casting rod that can “multi-task”, and a small assortment of baits that will help you fish the variety of cover types in your lake. When you read my list of no brainer baits, be sure to take into account the structure on your lake. If you know you’ll be fishing lots of heavy weeds, go long on the surface type baits. Lots of deep weeds and sunken islands? Go long on sub-surface baits. Tailor your selection to fit your own needs and don’t assume that you need everything on the list, at least not yet. After you get some experience Musky fishing, you’ll soon learn which baits to “get long on” and which to avoid. To make the “no brainer list” a bait has to be fishable for everyone no matter how much experience they have (or don’t have), in other words the bait has to have it’s own built in action. 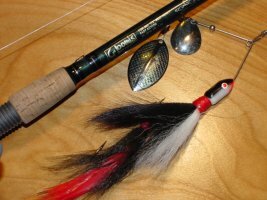 There are some really fantastic Musky baits that aren’t on this list and down the line, you should learn to use all of them. But for now, they’re excluded either because they pose some difficulty to a less experienced Musky angler or using them correctly calls for a higher level of experience. No Brainer #1 Top Water Baits. These baits are the ultimate for new Musky anglers. They are among the simplest of all baits to use and they perform exceptionally well over heavy weed cover but are also fantastic for fishing large shallow sand flats and adjacent breaklines where long casts are a must. Their glub-glub-glub sound helps call in fish from a distance and if you keep throwing, sooner or later you will experience one of those explosive surface hits that hook you for life. Baits like Salmo’s Turbo Jack, Arbogast’s Extra Large Jitterbug and Holcombe’s Top Walkers are among the many great surface plugs. Using these baits is as simple as casting and reeling, a steady retrieve over heavy weeds is best. Take care, don’t set the hook until you feel the fish. Many anglers, even experienced pros get anxious when they see the boil and set too soon. Remember that when you fish top-water, you almost always see the fish before it has taken the bait. No Brainer #2 Tandem Bucktail Spinnerbaits. I had to scratch my head about this one, but for my money, I’m going with the large spinnerbait style bucktails. 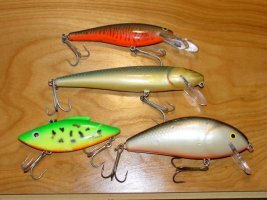 These are the safety pin style baits that remind you of the Bass fishing lures you’ve used or seen used except they’re bigger. They perform more consistently and are less prone to “quirks” than the in-line type bucktails. Unlike their inline cousins, it’s far less likely that the blades will hang up or snag, so you’ll be doing more fishing per cast. Since these baits that usually have a single hook or two single hooks instead of treble hooks, they are a lot more weedless and therefore more versatile. You won’t go five feet in a good Musky tackle shop without seeing some and they all do pretty much the same thing, but they’re not all equal. What you’re looking for is rugged construction, strong hooks and good swivels. Inhaler’s Rattle Tail Spinnerbait, Northland Tackle’s Bionic Bucktail or the Lindy-M&G Spinnerbaits are good examples. No Brainer #3 Crankbaits are another great option for less experienced Musky anglers because they can be fished in so many ways. The best thing about most crankbaits is that even if you don’t know exactly what you’re doing, simply casting them out and reeling (cranking) them back to the boat can still get you bit! Shallow running crankbaits can be fished like jerk baits over weed tops, around rocks or you can use a straight retrieve parallel to the weedline. Since most of them float, the shallow running versions provide a bit of immunity from sinking too deep into weeds and hanging up. As you become experienced, you’ll discover lots of tricks that add extra dimension to the baits. Virtually any large, shallow running minnow bait can be used but my hands down favorite for versatility has become Salmo’s Whitefish. These baits cast like a rocket and can be fished shallow with a slow retrieve, deeper with a fast retrieve or they can be fished like a jerk-bait. 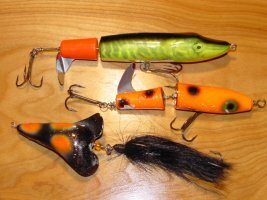 Bagley’s DB06, the Floating Rat-L-Trap and other large minnow type baits are all good choices. Now that you have a modest selection of reliable baits, you’ll need a rod/reel combination that works with all of them. No Brainer #4 G. Loomis Frog Rod. This rod wasn’t originally designed to be a Musky rod; in fact you have to look in their Bass section to find it. I don’t care what you hear from anyone about rods, you won’t find a more versatile, tougher piece of equipment. I add one or two to my arsenal every season and these rods are now performing 95 percent of all the big bait chores in my boat. Over the years a lot of our opinions about rods have changed. Most of us started out with fairly short “pool cue” type rods. Today, technology and materials have improved so much that we can actually use rods that are fun to fish with and still have power to land a really big one. If you want one rod that you can do almost everything with, this is it! Matching it up with a good reel is important and here your personal preferences and budget are most important. You can find good quality reels that match up well with these rods from several manufacturers. Look at Shimano, Garcia and Daiwa. I match the reels with Fireline because I like the low visibility and low stretch. All right, so there’s a start. One good rod, a modest selection of baits and a couple of ideas to get you started, that’s as far as we go here. In part two we’ll look at some sure fire ideas for trolling and go a bit further into Musky location and feeding preferences. If you’ve been on the fence about Musky fishing, this year go ahead and take the plunge! It’s easier than you think, really. So you want to get started Musky fishing but don't have a clue where to start. This super multi-purpose rig will get you in the ballpark every time. G. Loomis Frog Rod, 30 pound test and a well built Musky size Bucktail spinnerbait. Throw it out and reel it in, simple but effective. My favorite "no-brainer" top water baits are guaranteed to stir up some action, these top water baits combine visibility, sound and simplicity. Salmo's Turbo Jack (top) plus other chugging top water baits are super simple to use and cast like rockets. Bagley DB06, Salmo Whitefish, Floating Giant Rat-L-Trap and Salmo Fatso are versatile and simple to operate. Simply retrieving the bait will work because they have their own built in action, but as you progress, you'll be able to apply a variety of neat tricks that really help "seal the deal". What more proof do you need? Here's a nice fish for a first effort. Not a giant, but plenty good to get this new-comer hooked for life.